Transfer News: Arsenal target Iker Casillas set to stay Real boss Carlo Ancelotti gives big blow to Arsenal and Liverpool in their chase for Iker Casillas. Arsenal and Liverpool suffer blow as Real Madrid boss Carlo Ancelotti rejected Iker Casillas sale. Real Madrid have denied to sell their veteran goalkeeper Iker Casillas this summer, according to Spanish reports. The reports claimed that Arsenal and Liverpool were keeping strong tabs on him since last summer and were weighing up a bid for the coming summer window. The Spanish keeper who was promoted from Real Madrid academy has been heavily linked with a move away from Santiago Bernabeu in the past few months. The 33-year-old who has made more than 700 appearances for Real Madrid will now stay in Madrid as the boss Carlo Ancelotti clearly told the Spanish media. Ancelotti said clearly that they want to keep Casillas, he is happy and wants to stay too despite of his struggling time in the past few seasons. "Iker was very clear, he wants to stay. We want him to. I want him to." The Italian boss further admired him that he is a great player and a great man. Casillas lost his starting place last season but managed to play the Champions League campaign and lifted the tenth trophy in the end. 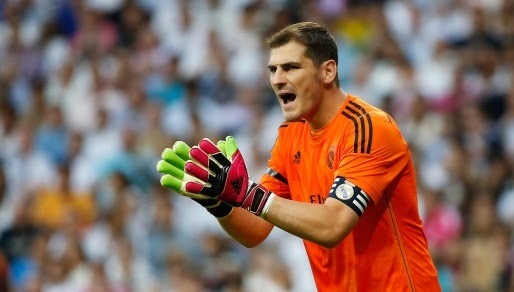 But he has been a regular this season, played 27 La Liga games so far this term and has kept 12 clean sheets.